We are so excited this year to announce our inclusion in the Blog&Buy Sale Christmas Wish List. The number one curated list of the very best creative products available to buy online. This bounty of a gift guide showcases a hoard of lovely wares of up & coming independent artists & designers which are normally quite hard to find. But the nifty Blog&Buy creators have cleverly brought them all together under one roof & done all the hard work for you! 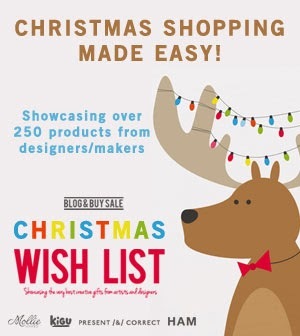 So go & have a gander at all the amazing handmade products being showcased & see if you can spot ours! There are also some great awards up for grabs, so if you like our products please do share the love!